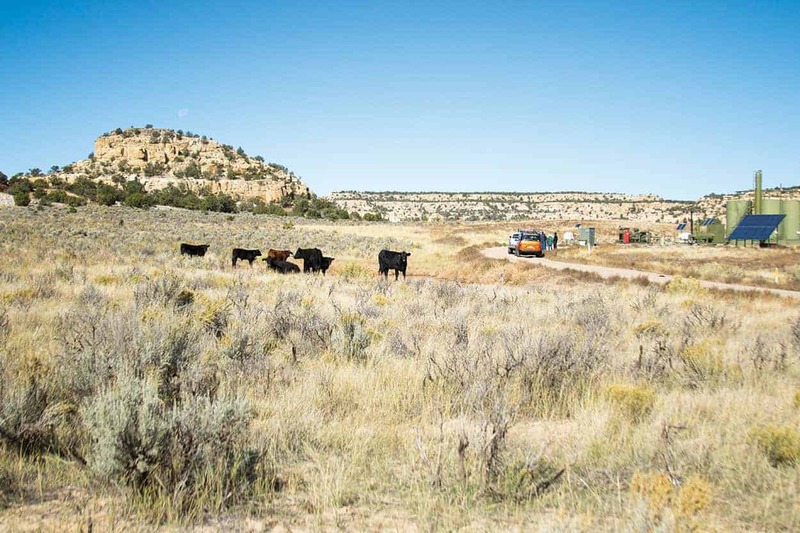 On a brisk autumn day outside Counselor in New Mexico’s northwest corner, bluebirds dip and dive as cows lazily graze on sparse, late-season forage amid a sea of sagebrush. If not for the seesawing of a nearby pumpjack and the hum of a generator powering the rig, the scene might not warrant a second glance. Wide open vistas and occasional outcroppings of badlands once distinguished the stretch of US 550 between Cuba and Farmington; yet over the past decade, dozens of hydraulically fracked oil and gas wells, sitting just a stone’s throw from the road, have interrupted this once tranquil scene. Of course, the view from the highway is just the beginning. 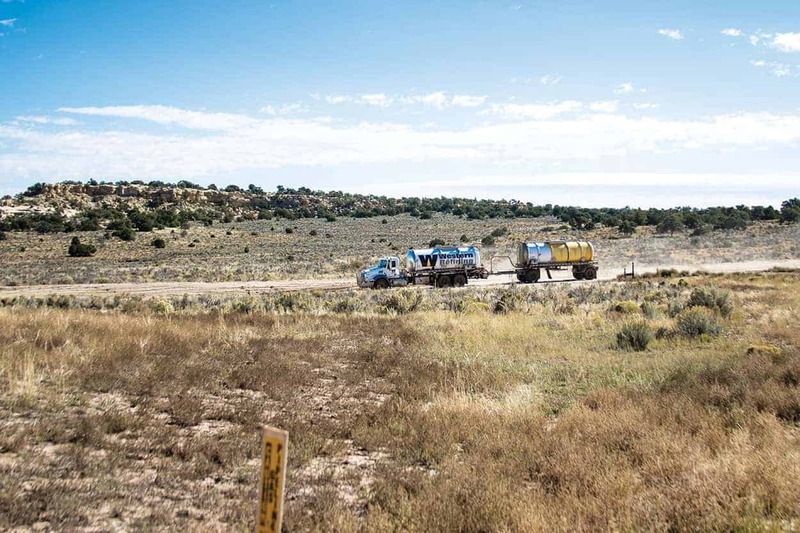 Forty thousand wells have been drilled in the San Juan Basin since oil and gas was first discovered at the turn of the twenty-first century, including four hundred new wells that have been drilled near Counselor since 2015. According to the San Juan Citizens Alliance, an environmental non-profit organization based in Durango, ninety-one percent of the public land surrounding Chaco Canyon National Historical Park has been leased for oil and gas exploration. Much of the remaining nine percent lies within a ten-mile radius of the park, a UNESCO World Heritage Site that houses some of the most important Ancestral Puebloan ruins. If oil and gas companies have their way, the Bureau of Land Management (BLM) could make these remaining parcels available for drilling in the near future. This worries Daniel Tso, who served on the Navajo Nation Council from 1986 to 1995. 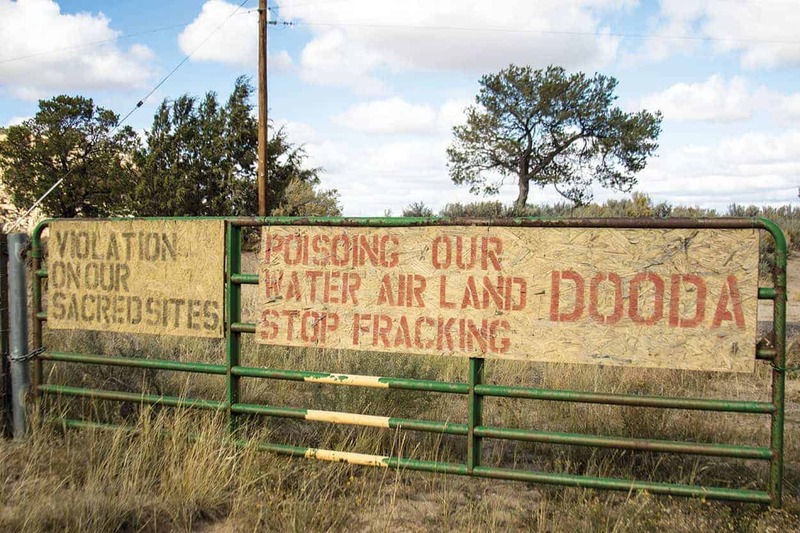 In addition to potentially destroying important archaeological sites, fracking threatens the health and well-being of the local Navajo residents who now populate the region. As part of his work to hold both the government and oil and gas companies accountable, Tso leads tours of fracking sites to show people, firsthand, the impact of this rampant development. With the cows looking on, he points to where escaped methane, one of the most harmful greenhouse gases, is being vented into the atmosphere. With oil tankers noisily streaming behind us, it is clear that fracking has become an inescapable part of life in northwest New Mexico. But what does that mean for the future of the San Juan Basin, the people, and the land upon which they depend? Hydraulic fracturing or fracking, as it is commonly known, is a process of extracting oil or natural gas by injecting a highly pressurized cocktail of water and chemicals into otherwise impermeable rock layers. The mix of chemicals and other particulates serves to break apart or fracture these formations and access fossil fuels not otherwise accessible through conventional drilling methods. Fracking was developed in the mid-twentieth century but until somewhat recently remained cost prohibitive because the technique requires far more resources than conventional drilling. As energy prices rose at the beginning of this century, fracking became profitable on a commercial scale for the first time. It has since been responsible for opening enormous geologic formations in North Dakota, Pennsylvania, New Mexico, and other states for large-scale extraction of oil and natural gas. The resource-intensive nature of fracking has raised significant health concerns. According to the non-profit Earthworks, a single fracked well that requires as much as four million gallons of water to develop would also use anywhere from eighty to three hundred thirty tons of chemicals. In most states, this mix of chemicals is considered proprietary, and companies do not have to disclose what they are injecting into the ground. “The great unknown is the proprietary mix of these chemicals,” says Mike Eisenfield, the Energy and Climate Program Manager for the San Juan Citizens Alliance. Particular communities in Greater Chaco are dependent upon pastoral industry and the health of their livestock. Horses and cattle owned by the indigenous community are seen grazing on open and unprotected fracking pads. Many of these fracking pads have recorded spills of either fracking fluid, wastewater, or crude oil and pose health risks to the livestock grazing on potentially contaminated grasses and wastewater. Still, chemicals commonly used in fracking are known; examples include benzene, ethylene glycol, arsenic, formaldehyde, lead, and mercury, in addition to dozens of other toxic chemicals. Much of this slurry returns to the surface, where it is captured and either treated or injected into deep disposal wells. However, some remains underground where, left to its own devices, it is no longer tracked nor controlled. While this study is still being compiled, Tso has plenty of anecdotal evidence that fracking in the area is already taking a toll on residents’ health. In addition to general fatigue, Tso and others have reported numerous other health issues including neurological, respiratory, and gastro-intestinal incidents. Additionally, the Counselor Chapter Health Representative reported thirteen cases of cancer between 2015 and 2016 among the 1,700 Counselor Chapter residents, a rate slightly above the national average. Other anecdotal evidence abounds. Near a relatively new well pad, in an area west of Counselor known as the Cornfield, the namesake feature has clearly seen better days. Last year, Tso says the corn grew over five feet, but as we drive by, the tallest stalk in the thinly covered field barely reaches three feet. Elsewhere, Tso reports that family gardens are seeing smaller yields, which for rural residents without easy access to grocery stores can be devastating. Entrance to Counselor Chapter House. A Western Refining (WPX) crude truck can be seen driving down the community road. These dirt roads were designed to support local community traffic and school buses, but are now heavily used by the fracking industry. 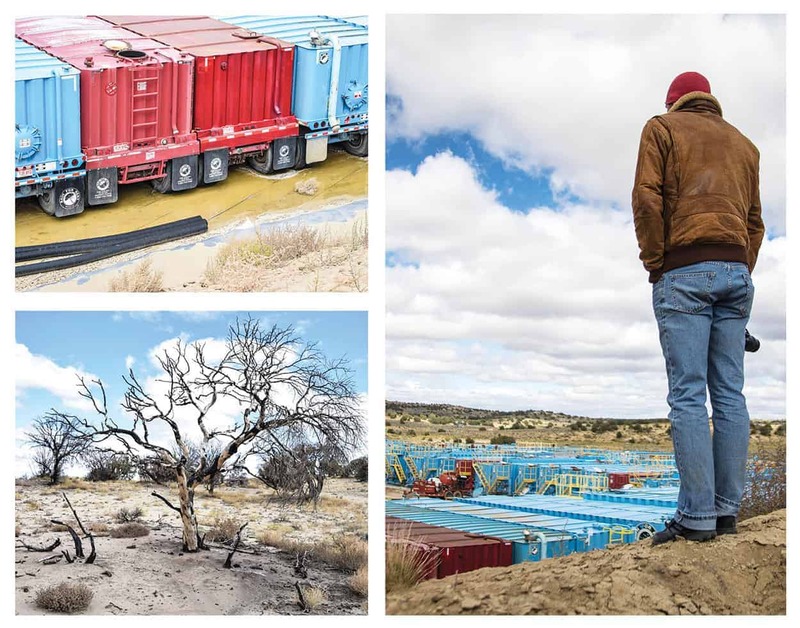 Ninety-thousand pound oil field trucks haul the volatile crude oil through pastoral lands, endangering livestock and community members. Fracking companies continue to level dirt roads to accommodate the weight of their trucks. The practice cuts roads deep into the landscape. Roads in Greater Chaco now resemble trenches and make travel dangerous, block scenic views of ancestral land, and hinder the ability to monitor livestock and fracking development. Fracking could also impact the area’s agriculture industry, both animal husbandry and traditional farming. Although reports in New Mexico have been relatively limited until now, those from other states present cause for concern. In 2009 in Louisiana, seventeen cows died shortly after drinking from a fracking wastewater spill. The following year in Pennsylvania, after being exposed to leaking wastewater, twenty-eight cows gave birth to calves that were either stillborn or horribly deformed. Elsewhere, cattle that have come into contact with these chemicals have demonstrated similar symptoms. Tso has observed cattle wading in water adjacent to well pads in New Mexico, and although testing of local stock ponds has largely proven them safe, the potential has continued to be a source of consternation for ranchers who graze their cattle on lands that have been leased for oil and gas. Another basis of concern has been the potential to use treated wastewater for crop irrigation. This has become an increasingly common practice in California, and studies have shown that toxic chemicals can persist even when wastewater has been treated. In one example, methylene chloride remained present in treated wastewater at levels five to eleven times that legally permitted in drinking water. Despite this, in 2014, one agricultural area in California relied on treated fracking wastewater for half of a 45,000-irrigated-acre region. Cause for even further anxiety is that organic certification does not specifically prohibit the use of fracking wastewater for irrigation, as federal organic standards precede the technologies developed to treat fracking wastewater. In New Mexico, fracking wastewater has yet to be used in this capacity, but Sandia Labs is currently developing new technology to treat wastewater so that it can be employed for agricultural purposes—something Tso is nervously monitoring. Additionally, oil companies from California to North Dakota to Texas to Pennsylvania, fracking has raised a host of concerns relating to the health of the people and the land, but in northwest New Mexico, drilling has also raised fears for Chaco Canyon, which served as the cultural and agricultural epicenter for Ancestral Puebloans more than one thousand years ago. At its peak, Chaco boasted dozens of great houses with roads leading in all directions to satellite and more distant communities that established the region as a cultural and trading center. The area was abandoned in the thirteenth century for reasons that remain hotly debated among archaeologists and modern Puebloan scholars, but both the park and the greater area have long been recognized as essential to understanding the history of the Southwest. Established as a national monument in 1907, the park continues to attract as many as fifty thousand visitors each year. This particular site caught fire on June 11, 2016, and was allowed to burn until July 14. The fracking fire and contaminants spread to areas north and south of the fracking pad, burning juniper trees within two hundred feet of residential buildings. This fire is not the only documented case in the Greater Chaco area where communities were disrupted and evacuated in the middle of the night. While community members remain concerned about their health, WPX reported that the incident was not an emergency and that no damage was caused to groundwater. Despite the area’s stature as an important historical site, the possibility of fracking in Greater Chaco remains a very real prospect. In 2003, the BLM completed its Resource Management Plan (RMP), a large-scale planning document that directs the agency in balancing different land uses. However, the 2003 RMP did not include or account for fracking in the Greater Chaco area. In 2014, the agency acknowledged this deficiency, and it is in the process of drafting an amendment to the RMP that will analyze the potential impacts of fracking in the area. In the meantime, the BLM continues to grant permits to drill. At the moment, there are as many questions as there are answers surrounding the impacts of fracking in northwest New Mexico. The visual impacts are marked and obvious. How the region’s air, water, land, history, and people will ultimately fare remains to be seen, but all indications provide significant cause for concern.